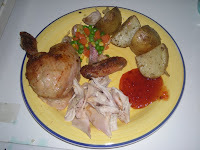 The chicken was rubbed with spices and sent into the oven. 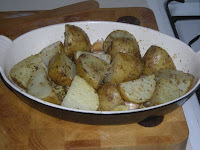 Some potatoes were quartered, doused in olive oil and dusted with coarse salt and dried herbs. 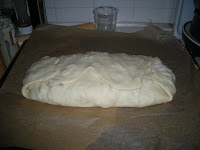 Once that was sorted they, together with a fair few garlic cloves, went into the oven too. When the chicken was done it ended up resting under a foil tent. In the meantime I made the gravy in the roasting tin. It was all served with some veg and some really nice habanero chili jam. Chicken breasts are easy and versatile to cook with. This recipe gives you some tasty chicken with a crispy top of garlic. You could put the chicken breasts under the grill before chucking them into the oven if you want to give them some extra color. Preheat the oven to 240c/475F/Gas mark 9. Mince and mash garlic to a paste with 1/2 teaspoon salt, then transfer to a bowl. Stir in oregano, sage, red-pepper flakes, oil, 1/2 teaspoon salt, and pepper. Cut a pocket in each chicken breast and push in 1/4 of the garlic mixture into each breast. 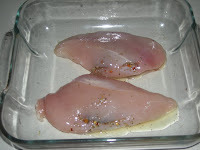 Divide the remainder of the mixture between each breast and coat the top of them with it. 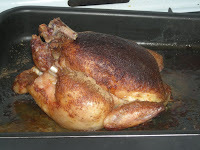 Roast the chicken in the oven until cooked, about 20 - 25 minutes. 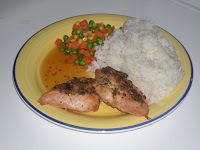 Serve with rice and vegetables. I also added some chilli jam to get some extra kick to it. Some times a quick pasta dish is just what the doctor ordered. It's turning colder in the evenings now so it can be nice to have a bowl of hot steaming pasta with a hearty sauce in front of you. Put the pancetta under the grill until crispy, put to the side. In the meantime cook the pasta according to the instructions on the packet. 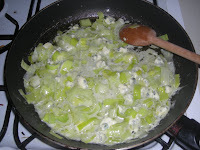 Melt the butter in a frying pan and fry the leek until it starts getting soft and slightly translucent. Crumble in the cheese and gently fry until it is melting. 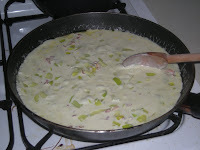 Stir in the cream and let everything gently simmer away until the sauce is starting to thicken. Taste the sauce and add salt and pepper to taste. Drain the pasta once it's done and stir in the sauce thoroughly. Serve with the crispy pancetta on top. Sorry about the delays in posting anything here but work is manic at the moment and I just don't seem to remember to take pictures of and document what I cook. But, I promise to try and update more often from now on. 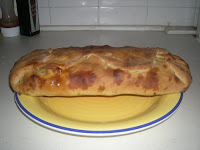 Homemade pizzas always taste better than the ones you buy in the shop and I particularly like Calzones. You can vary the fillings to suit your taste, this is just a suggestion. Start by grilling the bacon until it's crispy, cut into small pieces and put to the side. Fry the mince in the olive oil until it starts to brown, then add the sliced mushrooms and the onion and let this slowly fry until the onion is nice and soft. 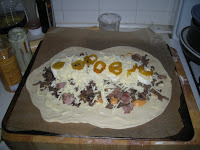 In the meantime prepare the pizza dough and roll it out into a more square shape than you'd normally do for a 'normal' pizza. Spread the base with the different mayos and then put the mince, mixed with the bacon, on top of this - leaving a bit of an edge so you can close the pizza up later. 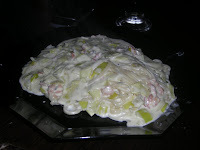 Top with mozzarella and grated cheese and finish off with the sliced pickled chillies. 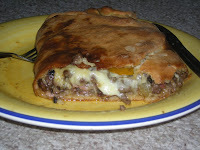 Close up the pizza and put it into the oven for 25 minutes or until it's nicely browned.